Nah, I prefer chocolate, but thanks anyways. Nah, if I eat chocolate I turn super cheerleader, which makes me invulnerable. Great. I need to find what makes me super. In the meantime, I think I'll wait for everyone else to catch up. No contest otherwise. I'm not here for the contest. I'm here for the spectacle. But I'm is ready this time. *Dodges out of way meaning Knuckles crashes into tree* Sorry Knuckles but this is contest. I think its time to make a speedy exit. Hasta la vista everyone! Ahem, sorry, was that over the top? Pass some popcorn to me. I need my energy to keep my lead against the rest of you. Sure thing, help yourself. I've got an unlimited supply of this stuff, thanks to tapping into the inherent randomness of this area. Hey look, all seven of the Sol Emeralds have been conveniently teleported into my lap for this thread. Make me mad and I'll use them to become *Dramatic pause* BURNING BLAZE! I don't need any Burning Blaze attacking me at the moment, I think I may already be a target by Shadow and Knuckles, so I will just quietly start moving ahead again. Darn it I'm out of stuff to throw. Hmmm... *walks over to Skye* How much do you weigh? Don't even think about it Shadow. I still have a temporary unconscious Knuckles here. I don't want to throw him but if you throw Skye or anyone else at me, I will throw Knuckles. Unless he wakes up, then I will find some other way to get revenge. I can't see your post. I'M BLIND! NOOO! *Gets up off of DragonLord* What in gods name is this????? 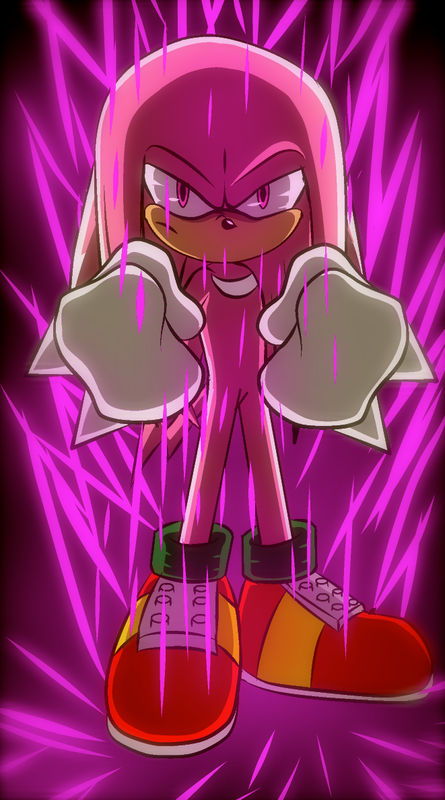 There's only one way to stop a cheerleader and that's.....*jumps onto Master Emerald and transforms* Hyper Knuckles!!! Umm... I had nothing to do with you being thrown anywhere Knuckles. MOBIANS AND OVERLANDERS. MAY I PRESENT TO YOU A BATTLE, MORE AMAZING THAN SUPER SONIC VS HYPER KNUCKLES! !!!! !HYPER CHEERLEADER VS HYPER KNUCKLES!!!! !